WinADay.com, an unusual online casino with a most extraordinary suite of whimsical, one-of-a-kind slot machines and video poker games, launches its latest creation today, St Patrick’s Day. The new Leprechaun Luck slot is a 5-reel, 31-payline game. It features Wild and Double Wild symbols, a Cauldron bonus and an adventurous Bonus Game. Like all slots at WinADay, it is tied to the site’s progressive jackpot which is currently nearly $150K. 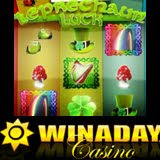 To celebrate the launch of the new game, two special St Patrick’s promotions begin today at WinADay.com. The 20 players with the most total bets on the new Leprechaun Luck slot machine between now and March 23rd will be declared “Leprechaun Best Betters”. The top Best Better will receive $500, the next four will get $250, the next five will get $100 each and the remaining ten will each get $50. Everyone that plays the new Leprechaun Luck game until March 23rd will also get one ticket in a random draw for the $500 “Leprechaun’s Pot o’ Gold” prize. A total of $3000 will be given away – and that’s no blarney! Leprechaun Luck is really two games in one. Collecting four symbols -- Shoes, Hat, Harp and Horseshoe – triggers a bonus game that’s similar to Snakes and Ladders. Bets can be multiplied up to 500x if the little leprechaun steps on the right shamrocks. Five rainbows with a $5 bet wins the big jackpot on Leprechaun’s Luck. It’s just a month since Sara M hit the WinADay progressive jackpot for $115,803 playing the Vegas Mania slot machine but since WinADay has been so busy lately the progressive jackpot has already gone way over that. Bonus Poker is the Game of the Month at WinADay and everyone that plays that game is automatically entered in another draw. At the end of the month five randomly drawn players will split $500 in prize money. At the end of the year, all Game of the Month tickets will be entered in one draw for a Dell Studio 15 laptop. “New game promotions and weekly, monthly and year-end draws, it’s getting hard to keep track of all the ways we give away money these days!” said Michael Hilary of WinADay.com. WinADay.com has 11 fancifully-designed games: six unique slot machines and four video poker games. They’re all instant play, no download games that are available only at WinADay.com.